There was a time, not too long ago, when Easter was a big deal here at TE. Actually, it wasn’t even called TE back then. So I guess maybe it was a long time ago. Yup, this is the worst introductory paragraph ever. There was a time, long ago, when Easter was a big deal here. Not only was it exciting because I’d wake up to a buttload of free candy and maybe an awesome gift or two, but also because it was fun to write about. Well, the candy was fun to write about. I don’t know why, there’s just something that really clicks for me when it comes to Easter candy. More so than candy themed for any other holiday, even Halloween. Alas, those days are naught but a memory, and while my mom does still put together a little something for me, I’m long since officially too old for Easter as I’ve always known it. Now it’s all about Jesus and brunch buffets instead of chocolate and jellybeans. I certainly don’t like the transition, but it’s not like I really have a choice, now do I? Because of the wonderful power of maternal sympathy, the wife and I received a nice little package of goodies from my parents this year, and these Peeps are the most interesting thing that was found within. It also contained some mini Reese’s peanut butter cups, Cadbury Mini Eggs, a box of K-cups, and more chocolate footballs than I could count. While at first it seems like it would be incredibly difficult to choose one thing to be the most interesting from that lineup, the Peeps have a serious edge that I didn’t even notice until I put the first one in my mouth Notice that they are, in fact, Party Cake Peeps. I didn’t notice this because I wrote off the festive box as just an Easter theme without actually inspecting it first. So what defines the Party Cake Peeps? What makes them so much more interesting than their standard-issue brethren? Not a lot, I’ll be honest. It’s a stretch to call them interesting, even with that fancy-pants wrapper. A Peep, normally, is just a chick-shaped marshmallow slathered in sugar. So, sugar wrapped in more sugar, if you want to be pessimistic. 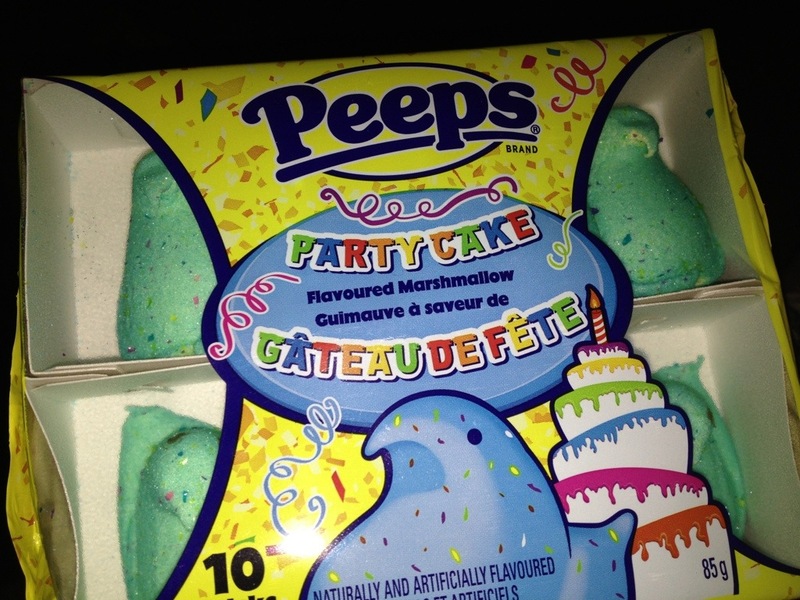 The Party Cake Peeps, on the other hand, are flavoured. I’ve never eaten -or even seen– flavoured Peeps before, so this was a major revelation for me. I didn’t know that the technology existed to endow the humble Peep with such a wondrous gift. The future truly is now. Anyway, while the PCPeeps do bear a smell reminiscent of cake, the flavour isn’t nearly as strong as the scent, They mostly still taste like marshmallows, but with a little hint of vanilla? I’m not sure what the flavour is, I’m actually really bad at that. I know that there is a flavouring, but I am completely unable to identify it. It doesn’t help and disappoints me greatly that the package doesn’t actually tell me what it is, not even in the ingredient list. 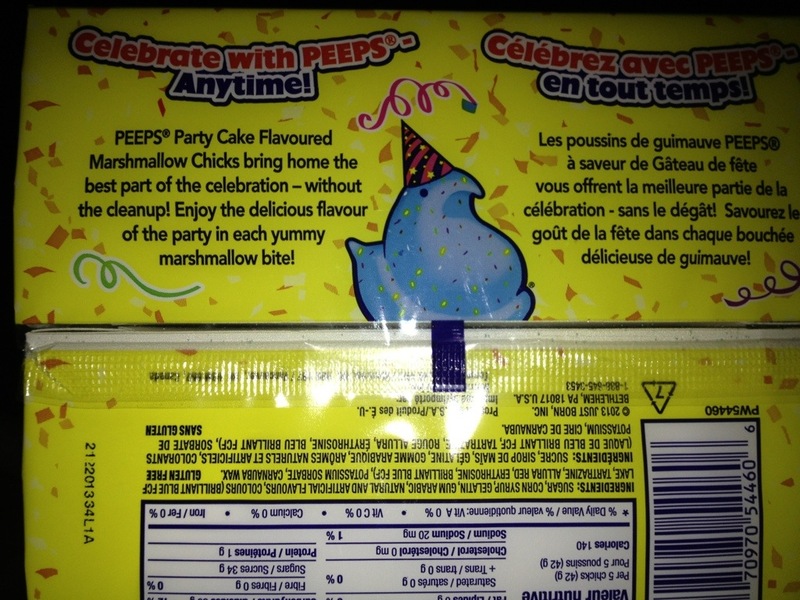 For all I know, these Peeps are party-flavoured, because that’s what the blurb on the back says. I wasn’t aware that “party” was a flavour. 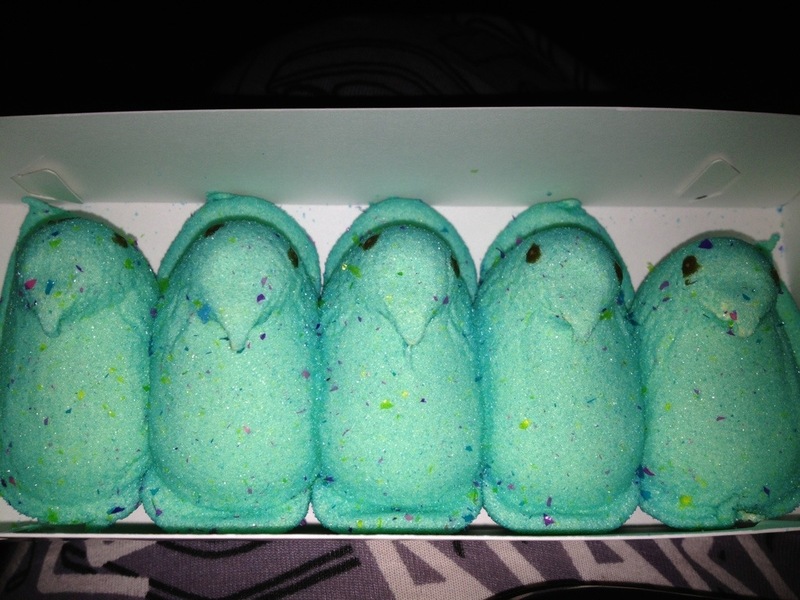 The PCPeeps are also an irradiated shade of green, unlike the cool blue Peep pictured on the packaging. The little sprinkles are a nice touch. I like sprinkles because mentally I’m about six years old. So, there’s not really much else to say about these little guys. Fact is that even flavoured, sprinkled Peeps aren’t nearly interesting enough to write about at length. I know; I just tried! Hell, thanks to this piece I might be the world’s most dedicated Party Cake Peeps fan by default. I doubt anyone else has or would even be able to put down more words about them than I have here, and I’m already padding this thing to high Hell. I dunno, I guess you could write a song or something about them. “World’s Most Dedicated Party Cake Peeps Fan” isn’t exactly a honour that I want to put on my resume. Oh, and I suppose that if you absolutely need something to take away from this, yes, the Party Cake Peeps are yummy. A++ would eat again.